Hi all! 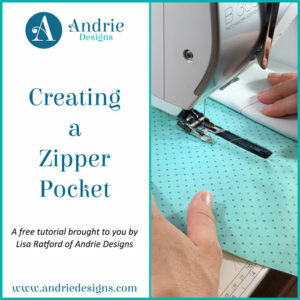 It’s time for another free video tutorial and this time I’ve popped up a video on how I like to create zipper pockets. There are several different ways to do this, however after a bit of trial and error, I’ve found over time that our method seems to be the easiest to follow, and the most fail safe as well. As always, these tutorials are able to be viewed at anytime via the Video Tutorials page, with new tutorials being added on a regular basis. Simply click on an image to start the video, and feel free to share across social media as well! I am working on the Creative’s Tote pattern which you can find here. Fabric is available from Precious Time Fabric and Quilts which you can find here. This entry was posted in Video Tutorials and tagged andrie designs, andrie designs patterns, bag maker, bag pattern, bag pocket, creatives tote, sewing, sewing pattern, zip, zip pocket, zipper, zipper pocket.